In accordance with original agreements, this temporary work has been dismantled and removed eleven month after it had been erected. "HOrigamiUSE" is being sponsored by the AllbauStiftung, and was constructed with the support of Ingenieurbüro Lars Römling. The brochure´s size is A 5 portrait; it has 132 pages. The content includes a text by the curator Dr. Sabine Maria Schmidt, one "diary" each of Lisa Lambrecht-Wagenitz (as a neighbour of the sculptures park), and Frank Bölter (as the artist), and numerous pictures. The publication has been entered into the state "NRW Bibliographie" library catalogue; see here. It is available from the association Kunst am Moltkeplatz KaM e.V. ; contacts here. 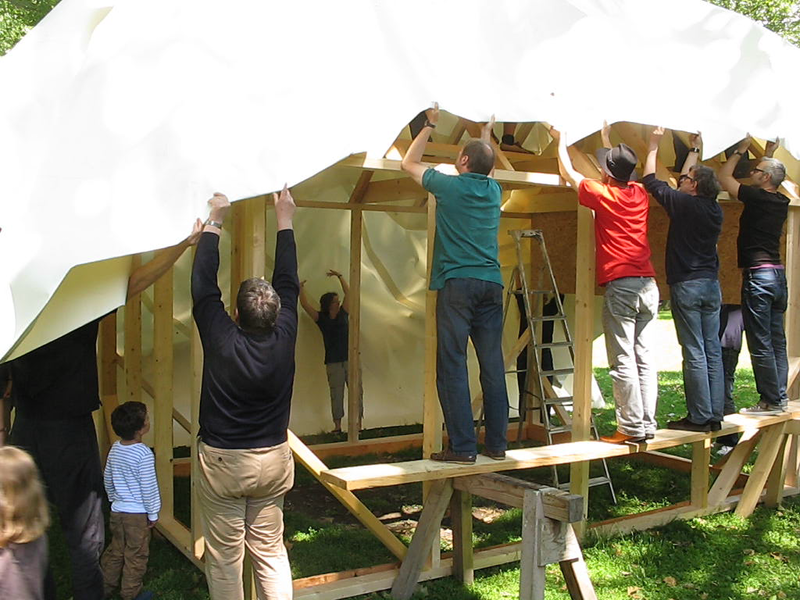 As a first step towards the removal of the taller-than-man paper "HOrigamiUSE", which had been folded according to an Origami instruction and erected on 22 June 2013, a total of approx 250 sq m of its laminated white thin cardboard surfaces (alike to fruit juice packaging material) have been dismantled. A total of up to ten persons - members of KaM and other persons interested in public art at the Moltkeplatz - worked for up to four hours to remove screws, other material, and the paper. The wooden sub-structure was dismantled and removed a few days later. Finally, rolled sod was laid to cover the former foot print of the "HOrigamiUSE". 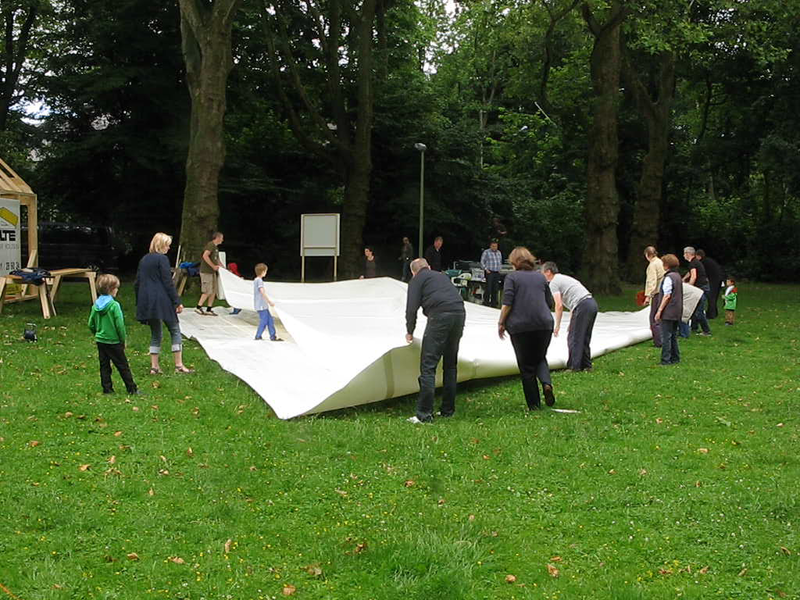 Within the action young Art At The Moltkeplatz/junge Kunst am Moltkeplatz Frank Bölter had on 22 June 2013 - jointly with members of the association KaM, other people interested in art, and neighbors - folded and erected on the Moltkeplatz his taller-than-man paper "house" folded according to an Origami instruction starting with a sheet of laminated paper of 15 x 15 m size. After having spent eleven months outdoors - and exposed not only to the weather - it has aged and changed. In accordance with the original planning this temporary work will now be dismantled and removed in the near future. The association KaM, the artist Künstler Frank Bölter, and numerous guests bid their farewell to "HOrigamiUSE", and toasted the artist, his work(s), and the Moltkeplatz. Because of the weather, parts of the event were held in the parish hall of the SELK church. Videos and pictures taken during various phases of the lifetime of "HOrigamiUSE" where shown and there was ample time for discussion. 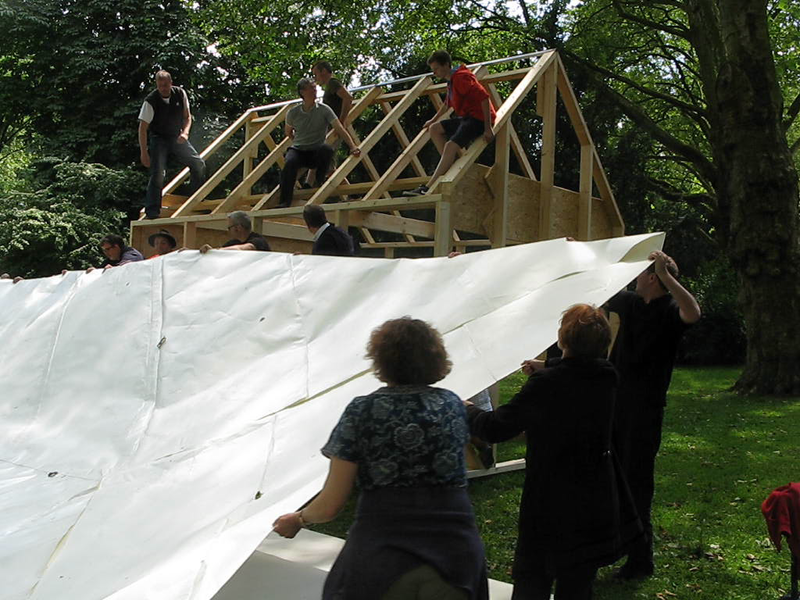 on 22 April 2014 KaM members have repaired the roof of Frank Bölter´s "HOrigamiUSE". During the Easter holidays a branch had fallen from a tree above and had cut a hole in the paper roof. Click here for a sequence of pictures since the "HOrigamiUSE" was erected on 22 June 2013. Frank Bölter paid a visit to the Moltkeplatz in order to, among others, take pictures of the current state of his "HOrigamiUSE". the roof of Frank Bölter´s "HOrigamiUSE" has been repaired. In addition to the gradual ageing due to storms and lots of rain the roof had been damaged on 08 January when trees were cut and parts fell through the fragile roof. On 09 January, KaM members had formed - out of the left over original laminated paper material - a square which was put on top of the roof by Fa. Nolte Ingenieur Holzbau staff first thing in the morning on 13 January. Click here for a sequence of pictures since it was erected on 22 June 2013. Frank Bölter´s "HOrigamiUSE" has now been standing at the Moltkeplatz for some six months. Storms and lots of rain - especially during the autumn months - have left their marks on the work. Click here for a sequence of pictures since it was erected on 23 June 2013. The discussion was led by Stefanie Klingemann, Cologne (artist, curator, and editor of the artists´ magazin MOFF). It basically covered Frank Bölter´s approach as an artist and the way he works. This was illustrated both verbally, and with pictures and videos of past works. Throughout the discussion there was an open and eager exchange with the audience . 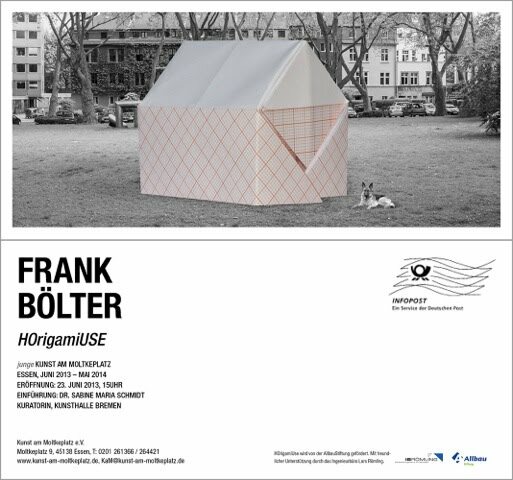 Obviously, a special focus was placed on Frank Bölter´s "HOrigamiUSE" which was folded and erected at the Moltkeplatz in June 2013 by the artist and a large group of participants, and the development of this work. There was sufficient time for a walk around the work in the park opposite the church, and more discussions back at the parish hall... which also helped to warm after the time outside. The WAZ newspaper had carried an invitation note. KaM´s invitation here. End of October 2013: in the annual compilation "KUNSTJAHR2013. Die Zeitschrift, die Bilanz zieht", Frank Bölters "HOrigamiUSE" and the Moltkeplatz are mentioned in a feature by Marion Leske on Art in Public Spaces. Click here for the paragraph. 22 October 2013 approx 11 p.m. a sudden thunderstorm with a small twister has wreaked havoc at the Moltkeplatz: thick tree branches were sheared off, and cars were smashed; necessitating hours-long work by the fire department and the police. 23 October in the morning: the sculptures have been spared by the storm... with the exception of Frank Bölter´s "HOrigamiUSE", where streches of the folded paper sheet have become undone. 23 October 11 a.m. following some short-notice work by members of the association KaM - and with the help of professionals of Fa. Nolte Ingenieur Holzbau - Frank Bölter´s "HOrigamiUSE" has been restored to its previous state. 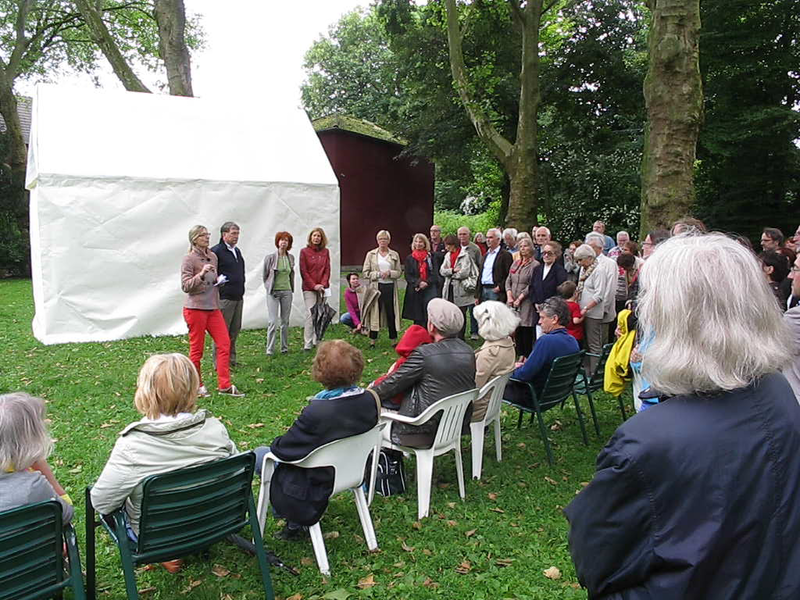 the vernissage and the opening was held for Frank Bölter´s work "HOrigamiUSE". Dr. Sabine Maria Schmidt provided the introduction. Vernissage on 23 June 2013: Dr. Sabine Maria Schmidt provided the introduction. The Informationsdienst KUNST mentions the project in their isssue 531 of 27 June 2013 (p. 13). Press articles on 16 June in LINTORFER (announcement), and on 26 June 2013 in the Essen Südanzeiger here. 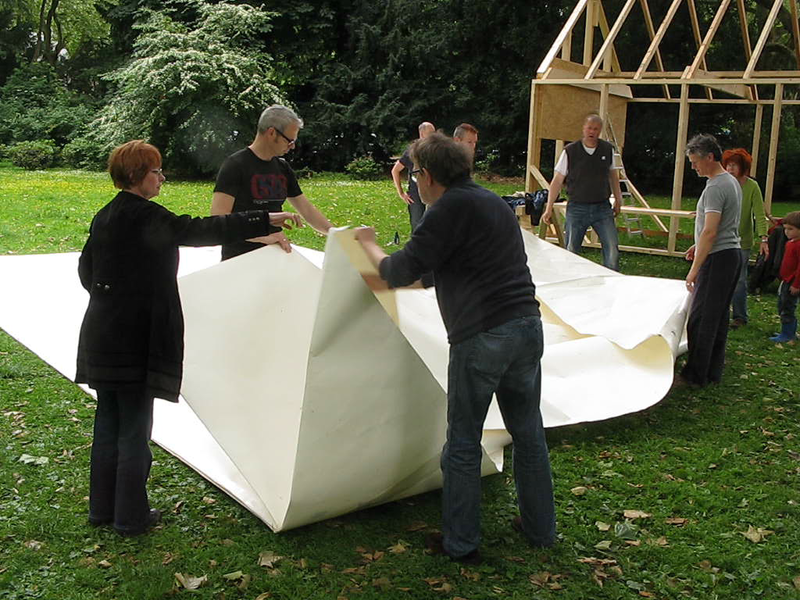 as the fourth work within the project junge Kunst am Moltkeplatz / young Art At The Moltkeplatz Frank Bölter erected his taller-than-man paper "house" folded according to an Origami instruction on the Moltkeplatz. Members of the association KaM, other people interested in art, and neighbors had been invited to participate and have helped in great numbers and throughout the day. 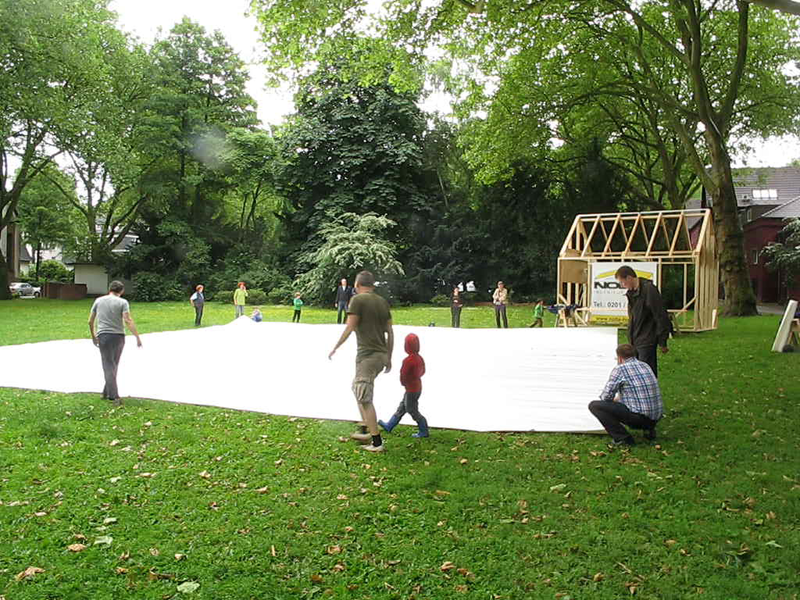 Erwin Wiemer has filmed the folding of the 15 x 15 m size single sheet and the erecting of the folded paper house. The video can be viewed in YouTube; for the entry click here. 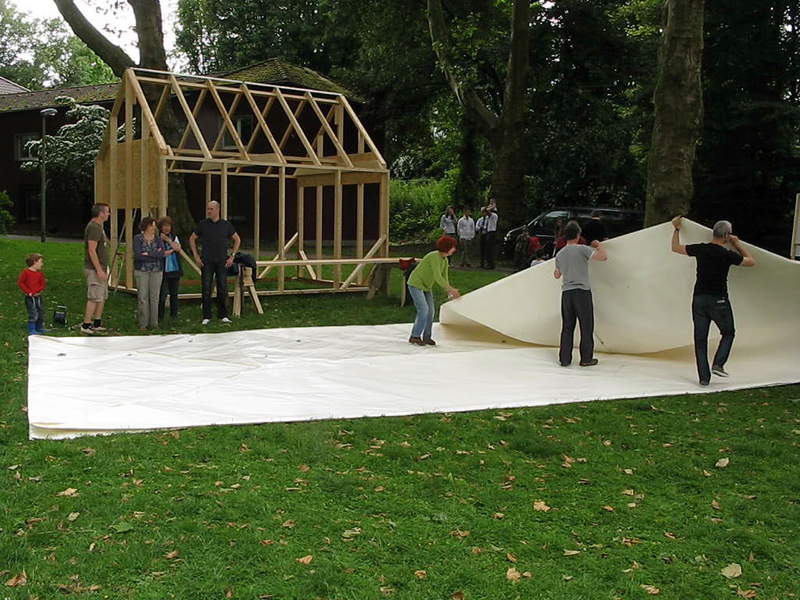 on the previous day: combining several stretches (1.3 m wide each) into a single 15 x 15 m sheet. Instructions on how to fold the sheet of paper... with step-by-step explanations by Frank Bölter, and documentation on two wooden planks. Frank Bölter - within the project Kunst im Wohnraum / Art in the Living Room Essen - put up for display an urban landscape showing various Origami folded model houses.